The microblogging social media platform Twitter is increasingly being adopted in the urologic field. We aimed to analyze participants, tweet strategies, and tweet content of the Twitter discussion at a urologic conference. 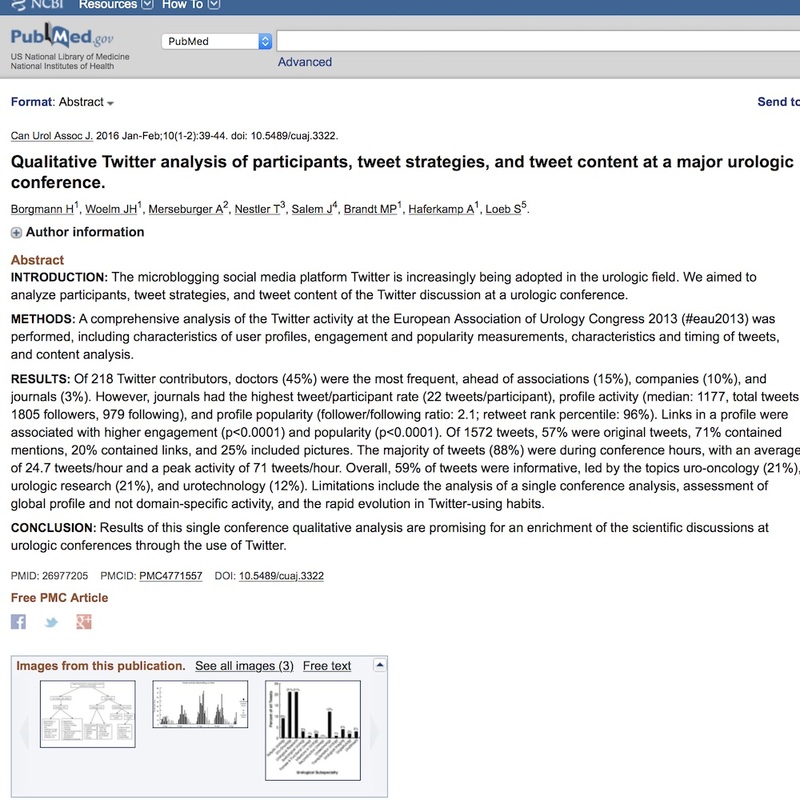 A comprehensive analysis of the Twitter activity at the European Association of Urology Congress 2013 (#eau2013) was performed, including characteristics of user profiles, engagement and popularity measurements, characteristics and timing of tweets, and content analysis. Of 218 Twitter contributors, doctors (45%) were the most frequent, ahead of associations (15%), companies (10%), and journals (3%). However, journals had the highest tweet/participant rate (22 tweets/participant), profile activity (median: 1177, total tweets, 1805 followers, 979 following), and profile popularity (follower/following ratio: 2.1; retweet rank percentile: 96%). Links in a profile were associated with higher engagement (p<0.0001) and popularity (p<0.0001). Of 1572 tweets, 57% were original tweets, 71% contained mentions, 20% contained links, and 25% included pictures. The majority of tweets (88%) were during conference hours, with an average of 24.7 tweets/hour and a peak activity of 71 tweets/hour. Overall, 59% of tweets were informative, led by the topics uro-oncology (21%), urologic research (21%), and urotechnology (12%). Limitations include the analysis of a single conference analysis, assessment of global profile and not domain-specific activity, and the rapid evolution in Twitter-using habits. Results of this single conference qualitative analysis are promising for an enrichment of the scientific discussions at urologic conferences through the use of Twitter.